Home > Manufacturing > Yorkshire firm cooks up one “Heck” of a sausage! Yorkshire firm cooks up one “Heck” of a sausage! A family of British sausage makers has gone back to the kitchen table to launch a brand new range of top quality British pork sausages. The award-winning Keeble family is cooking up the new venture that’s set to be the “pork of the town”, and they have revealed their game-changing plan this summer. 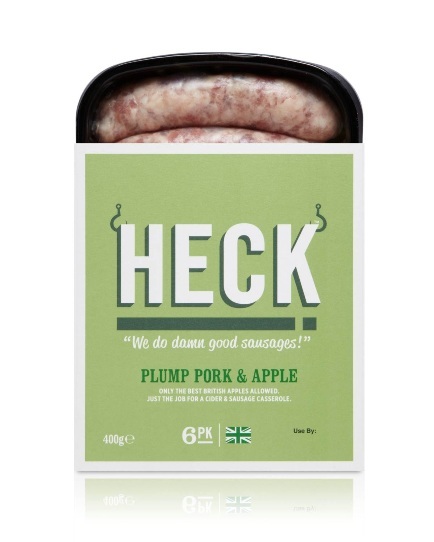 HECK is a new range of sausages with a strong set of beliefs behind it, offering farmers’ market quality on the high street and made with simple, good ingredients with provenance at its heart. The boutique sausage company is committed to small batch production, supporting British pig farmers with a fair price scheme and full traceability down to every last ingredient. HECK, which will be produced near the family farm in Thirsk, is the couple’s second sausage venture and they’re keen to inspire the next generation and bring rural and urban closer together. This time, they have brought in the help of their four grown up children who were ready to fly the nest but who have returned to the family farm to get stuck in and work alongside their parents instead. They have just secured their first national supermarket listing with Tesco and three of their sausage recipes will go on sale in April – Pork & Proud, 97 per cent Pork and Plump Pork & Apple. Other recipes in creation include the Superior Skinless, Squasage (square sausage perfect for sandwiches), Mediterranean Chicken and Fresh Chorizo. Part of the couple’s plan is to bring better quality black pudding to British supermarket shelves, promoting the benefits of using the whole of the pig rather than just the more common and popular cuts. As a self-confessed hater of black pudding, Debbie visited the Normandy Festival du Boudin, and came back a convert after visiting spotless, high tech factories making top quality Boudin Noir from the freshest ingredients – a world apart from the average UK supermarket offering that’s often too hard, rusk-filled and made with dried, imported blood. HECK will eventually include a quality French-style Boudin Noir sausage, initially made in France but expected to be brought back into local, UK production once their sausages are more established. “We’ve had a lot of late nights round the kitchen table coming up with the perfect set of sausage recipes. With the British meat industry rocked by the recent horsemeat scandal, Andrew and Debbie’s aim is simple. They want to encourage people, in particular younger people, to return to trying sausages through a combination of good ingredients, well thought through recipes and reassurance that, with over 25 years of industry experience and knowledge, they understand the entire supply chain and can deliver on provenance. The Keeble’s recent research has revealed that young people are currently shying away from buying sausages, largely because they don’t trust what goes into them.